Batman's armored vehicle - the Tumbler! Based on the Christopher Nolan film, The Dark Knight Rises. Features flame exhaust, a Batman figure, and an amazing diorama base! The Tumbler, Batman's armored vehicle in Christopher Nolan's acclaimed Dark Knight trilogy, joins Kaiyodo's Revoltech line as this dynamite Batman: The Dark Knight Rises Legacy Revoltech Tumbler Vehicle Batman Figure and Display Base. 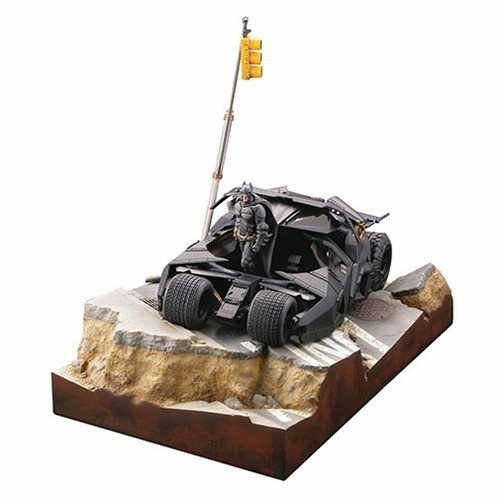 The Sci-Fi Revoltech #043 The Dark Knight Rises Tumbler Vehicle measures about 5 1/2-inches long and features flame exhaust and an amazing diorama base! It also comes with a Batman figure and a nameplate.